It is not so easy to find the singer using the melody of a stringed instruments in the night spots of Tashkent. Regardless, there are some artists, similar to the musical style of Brassens or Renaud in France, who gather during the evening to play russian and uzbek melodies. 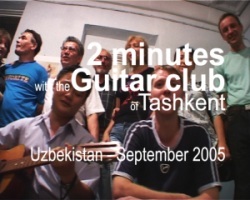 This night, we found them in the guitar club of Tashkent (video and music). Pas facile de trouver des chansonniers et la mélopée des instruments à cordes dans les lieux nocturnes de Tashkent. Pourtant, il y a des artistes, des Brassens, des Piaf et des Renaud, qui se réunissent le soir pour faire vibrer les chansons ouzbeks et cyriliques. Nous les avons trouvés au Club de guitare de Tashkent. Two songs of Dyma Makelsov (MP3 - 3 Mo each) -> Play one and two ! (WMV format - 3 Mo) -> Play ! Tashkent - Uzbekistan, the 15th of September 2005.